You’re about to discover some really, really GREAT news. Fact: It’s possible for you to Sleep-Yourself-Slim. Now I know you’re skeptical about that… but today I have science to prove it. And more importantly, if you’re one of the 35% of people that gets less than 7 hours of sleep a night, you need to make big changes to your life. But even if you already get 7-8 hours of sleep each night, there are a few tricks that my friend Shawn Stevenson is going to reveal today that help you get MORE health results from one of my favorite activities. I love sleeping, and knowing it can help you lose fat is a BONUS. Let me tell you about Shawn. He’s the host of “The Model Health Show,” the #1 fitness podcast on iTunes. We’ve been chatting on the phone recently, and he’s soon going to have me as a guest on his show. I can’t wait to share that with you… but first, today is a big day because his new book, Sleep Smarter, is going to hit #1 on the book charts today. Plus, keeping the room cool ‘activates your brown fat … and burns belly fat’, according to a study from the journal, Diabetes. Your room must be pitch black… so keep the electronic lights out of it. Wow. Imagine losing weight just because you made your bedroom darker. Great news! FACT: Ol’ CB wears an eye-mask and earplugs when he sleeps…Yes, I look like a goofball, but unlike Bally the Dog, I can’t fall asleep when it’s loud and bright. Adding those two cheap tools to my life has improved the quality of my sleep by 50%… especially when I travel. Going on an “electronic diet” in the hour before bed. A study from the journal Pediatric Obesity found that people are “one and a half times more likely to be overweight if they have devices in their bedroom.” So kick those electronics OUT of your bedroom. Avoiding heavy meals before bed… so that you avoid nighttime heartburn. Plus, big meals require digestion… and big meals can interfere with sleep quality. Avoiding alcohol two to three hours before bed. Booze might make you sleepy, but it ruins your sleep cycles and ability to get a good night’s rest. 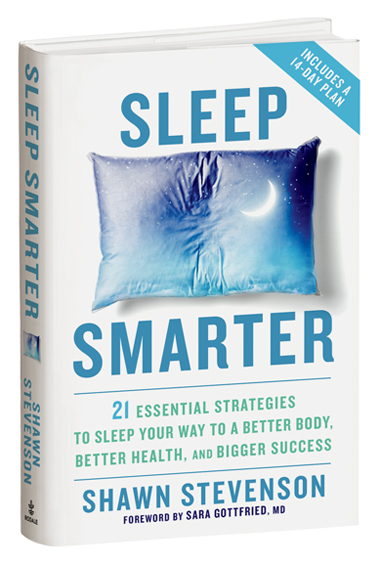 So if you want to harness the power of sleep for staying slim, you’re going to be blown away with what you learn in Shawn’s book, Sleep Smarter. He’s giving you a 14-day Sleep Makeover with tips and tricks like the specific time of day to exercise for improved sleep quality, what to wear to bed to avoid waking up at night, and simple ways to fall asleep faster. It’s so good to know that you can use these tips to sleep better, to wake up refreshed, to have MORE all-day energy, and even LOSE weight… simply by enjoying more rest. I strongly urge you to follow these tips and get Shawn’s book. Nothing else that works in the weight loss world is as enjoyable as getting more sleep. It’s a win-Win-WIN situation! PS – It’s OK to take care of yourself… I give you permission! Invest in yourself for the sake of others. Take care of your health and energy so you can deliver maximum love, life, laughter, and living to those that matter. Place a high value on your time. Don’t let others steal it away through insignificance. Remember… every moment wasted in meetings, traffic, surfing the web, gossip, etc. steals it from your children, your spouse, and your well being. You can – and WILL – succeed when you take care of yourself and bring your best self and high energy to all areas of life!